The last few weeks of 2018 were lovely and calm for us, as we enjoyed the festive season. We have been spending much of the last few months training, and had a fantastic lesson on lateral work, which gave us a great confidence boost. We are mainly focusing on Arlo’s lateral moves right now and have seen a significant improvement; he is stepping under more correctly and my trainer and I are looking towards the ground cover to go with this. The mild weather has had many advantages for us, most notably how Arlo is staying in good condition and how much easier training is when the snow is not packed up in his hooves. He’s still on his Dengie Fibre Diet and has the most glossy coat and bright eyes. We have been putting together our Elementary FSM for the Winter Regionals, which I am very excited about. It is the first time I have done my own music and floorplan so it was a refreshing change to have total control over my music. I wrote the floorplan after watching the Olympia Freestyle in December and when I revisited it in the morning, realised that I am a fair way off being Charlotte! After moving a few movements here and there, we now have a floorplan that is possible, and music that fits it very well, if I do say so myself! As with training any horse we have had one or two ‘interesting’ sessions where either myself or Arlo rolled out of the wrong side of bed, but thankfully mum has been spending some time in the arena with me, and this has made a massive difference. Sometimes all you need is someone on the ground with a lunge whip to gently encourage him to move laterally correctly. We have also been paying attention to his shoulder-in, and he is proving to pick this up much faster than some of the other lateral work. We have set some high goals for 2019, but there is no harm in dreaming big! We have qualified for the BD Winter Regionals at Morris Equestrian Centre near Glasgow in February for Elementary and the Freestyle. We are hoping for a top five place in both, and believe this is achievable as long as we keep up heads – collectively! We then hope to start moving up to Medium level, which will be a big jump for Arlo with regards to the increase in lateral work, we then hope to qualify for the U21’s Area Festival at Medium. Arlo’s changes are very much established, and he finds them so easy (that if I move a muscle slightly he obliges me with a clean change, whether I want it or not!). So as long as the transition to Medium is successful, we may be bringing home a few Advanced Medium sheets later in the year. Our main goals however are set for the summer. I was last able to go to the BD Youth Home International in 2015, and we hope that this year we might be selected for a place on the team. Whether this will be at Elementary or Medium depends on how successfully we progress to Medium at home, and of course our competition results. Our dream for this year however, is a rather big one; I am aiming to wear a tailcoat at Sheepgate in August in our FEI Junior Team Test debut. We came painfully close to this milestone on Gari (Watch Me!) in 2017 for the Scottish BD Youth Home International; we had even entered the competition, but that will only make this goal all the more rewarding if it is reached. Last time I rode at Sheepgate was 2016, so I would be on Cloud Nine if we competed there at Elementary, Medium and maybe at FEI Junior level you just never know what the year will bring! 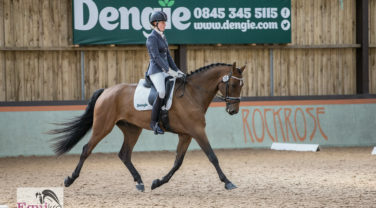 2019 is getting off to a busy start for me both inside the dressage boards and out of them. Today I passed my Practical Driving Test (Hurrah! ), massive thanks to mum and dad again for their support with this and endless hours of driving round country lanes and local towns with them beside me. Now I’m into two weeks of Advanced Higher Prelims (A Level Mock equivalent for those in England!) which are demanding but fascinating. After seeing on social media several riders postpone their dream for academics, I hope to prove that you can do both at the same time, and still have time to live life to the fullest! Wishing you all a great 2019 whatever your riding brings. It was my first Scottish Championships this year, despite qualifying on many different occasions, but it was certainly worth the wait!